Back in October of last year, I was perusing the Jamie’s Tarantulas website when I noticed a species listed that I hadn’t seen before. The Aphonopelma schmidti (Superstition Mountain Tarantula, among other more colorful common names) being offered was a 1.75-2″ female. I was immediately struck by the beautiful earthy tones of the adults—stunning blonds and rich reddish-browns—so I did some research on the personality and husbandry requirements. Described as a shy, somewhat skittish T, the A. schmidti required dry substrate deep enough for burrowing, low humidity, and room temperatures. Perfect. As the females posted on Jamie’s site generally don’t last long, I quickly purchased her. A photo of my A. schmidti shortly after I acquired her in October of 2013. When she arrived, I was immediately captivated by her giant abdomen, which seemed ridiculously out of proportion when compared to the rest of her body. After setting up her enclosure, being sure to add enough dry coco fiber to allow her to dig, I allowed her to sit and acclimate to her new surroundings. As stated in the accounts I had read, she immediately started digging and bulldozing her enclosure. However, unlike other burrowing species I keep, she never seemed quite satisfied with her work. Several times, she would completely bury herself for a few weeks, only to pop up again later through a brand new den entrance. Over the course of a month, she buried her cork bark hide, a plant, and two water dishes. January passed, then February, then March. Let’s just say, Aphonopelma’s distinction as slow growers is well deserved. Over this time, I made over a dozen more acquisitions. 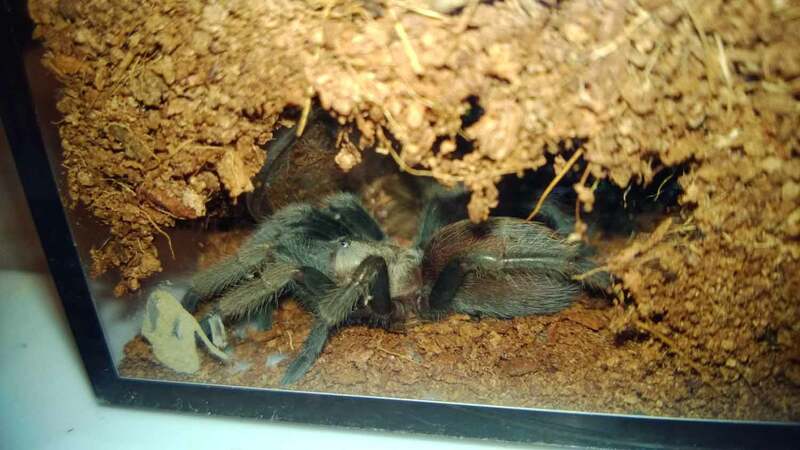 And as some of my other Ts molted three times, warranting rehousings, my little A. schmidti sat in the corner of her little burrow, only emerging periodically to drink or to endlessly rearrange her substrate. Then, finally, it happened. Last Friday, as I was getting ready for work, I noticed that she was upside-down. 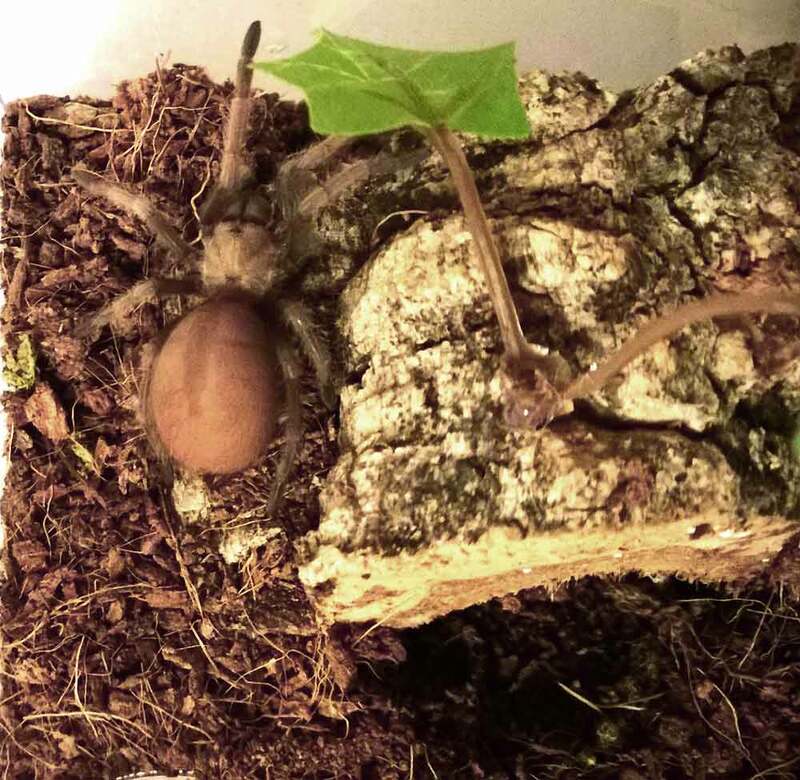 When I returned home that evening, it was to a freshly-molted T(FINALLY!). My A. schmidti three days after a long-overdue molt. With her tones becoming closer to adult coloration, I was reminded of what attracted me to this species in the first place. She now sports a strikingly blond carapace, redish-brown hairs on the abdomen, and a lightening of the color on her legs below the femurs. Although I haven’t been able to get a good measurement yet, she looks to be about 2.25-2.5″. Again, a slow grower, but well worth the wait. For those looking for an active, fast-growing species, an A. schmidti might not be for you. Although the non-stop digging and tunneling can be amusing, this is a T that can be quite secretive and will spend a lot of its time hiding in its den. Still, their husbandry is quite simple, and they are pretty little Ts who will likely outlive some of the faster-growing species, and when they do molt, it really is cause to celebrate. Personally, I think that the A. schmidti would make a wonderful first T for the patient keeper.